The Canadian Women’s Hockey League gets back in action this weekend after an offseason defined by change. For the first time in a dozen years, the CWHL has a new (interim) commissioner. Four-time Olympic gold medalist, and 2018 Hockey Hall of Fame inductee, Jayna Hefford is now occupying the office that had belonged to Brenda Andress since the league’s inception. But that wasn’t the only major change we saw in the CWHL over the summer. The Blades franchise moved from Boston to Worcester, where they will no longer have to directly compete for fans with the NWHL’s Boston Pride. Additionally, the CWHL is one team smaller than it was last year as the two franchises in China have merged into one team, the Shenzhen KRS Vanke Rays. This move has cut the number of players who were making a living wage as player ambassadors in half. During the offseason, there was an influx of American talent, one of the best draft classes in years, and four head coaching changes. Let’s take a look at where the league’s six teams stand before the puck drops in Montréal Saturday. Inferno general manager Kristen Hagg hit this offseason out of the ballpark. She brought in new head coach Shannon Miller, who led the University of Minnesota-Duluth to five national championships before winning her lawsuit against UMD for sexual discrimination. The addition of Miller helped attract a lot of talent, including three gold medalists from Team USA’s Pyeongchang 2018 roster. Brianna Decker, the NWHL’s MVP in 2016 and 2017, is almost certainly the biggest free agent signing of the 2018 CWHL offseason. Hagg didn’t stop at signing Decker, Kacey Bellamy, and Alex Rigsby, though. She also added the Hickel sisters (Zoe and Tori), veteran Finnish forward Venla Hovi, Halli Krzyzaniak and some exceptional rookies in the 2018 CWHL Draft. The Inferno had three key players retire over the summer and the two exceptional teenagers who were on the team last season are now in college. Also gone are two members of Canada’s national team from Pyeongchang: goaltender Geneviève Lacasse and forward Jillian Saulnier. Both players were traded to Les Canadiennes for future considerations. Russian forward Iya Gavrilova will also be out of Calgary’s lineup all year due to an ACL injury she suffered at the end of last season. Hagg selected Rebecca Leslie in the second round of the 2018 CWHL Draft. Leslie is coming off of a 57-point senior season at Boston University. She captained Canada at the 2018 Nations Cup and was invited to Canada’s National Women’s Team Fall Festival in September. The first woman in Terriers’ history to score 20 goals and pick up 30 assists in a season will help give Calgary a deep, dangerous offense this year. In a Les Canadiennes press release, general manager Meg Hewings called this year the beginning of a “new era” for Montréal. Hilary Knight, the most popular player in women’s hockey, is back with Montréal for a full season. She’s joined by newly acquired Pyeongchang silver medalists Jillian Saulnier and Geneviève Lacasse and returning Olympians Marie-Philip Poulin and Lauriane Rougeau. Hewings further bolstered her roster by drafting a lot of proven players in the last two draft classes. She’s signed four rookie defenders and four rookie forwards to Montréal’s 24-woman roster this year. No CWHL team saw more valuable players retire over the offseason than Les Canadiennes. Nine players including Caroline Ouellette, Cathy Chartrand and Noémie Marin hung up their skates. Marin was second on the team in scoring last year and Chartrand won the CWHL’s Defender of the Year at 36-years-old. Ouellette, who is a living legend for both the CWHL and Team Canada, will remain with the club as Montréal’s technical coach this year. “I’m excited,” Knight told the Sporting News. 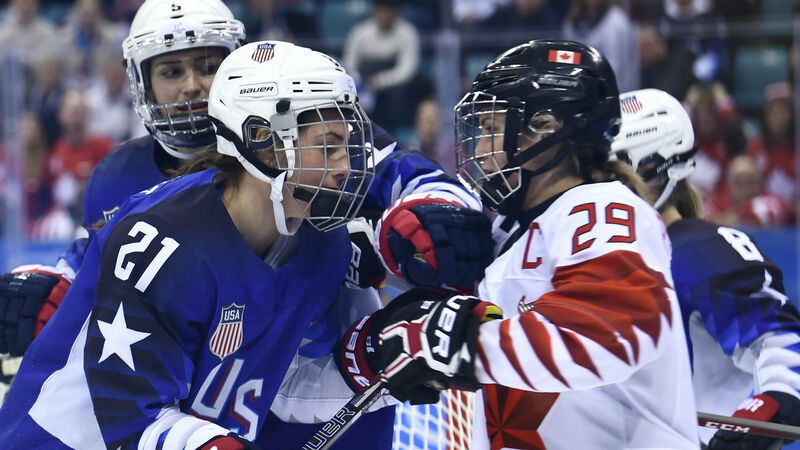 “Everyone has seen us faceoff in some of the biggest matches of women’s hockey. To finally be on the same team, to [grow] women’s hockey together and do that off the ice, but also to learn from one another and try to get a Clarkson Cup at the end of the season is exciting. On paper, Montréal’s greatest weakness might be it’s relatively unproven group of defenders. Thankfully for fans of Les Canadiennes, Montréal is backstopped by two elite goaltenders in Lacasse and Emerance Maschmeyer. The 2017 Clarkson Cup Champions are definitely going to be in the hunt again this year. Bach was a Top-3 Finalist for the 2018 Patty Kazmaier Award in her senior season at Boston University last year and finished third in the nation in points (67). She peppers the net with shots, scores goals in bunches, and will be a big contributor on Markham’s power play this year. The Thunder’s defense, led by Laura Fortino, Jocelyne Larocque, and Megan Bozek, is one of the best in the league and Markham’s goalie duo of Erica Howe and Liz Knox is rock solid. The biggest difference from last year is that the Thunder’s offense looks significantly better, which is good news for a team that struggled on the power play a year ago. Markham wasn’t expected to win it all in 2018, and most would agree that they aren’t favorites to win the Clarkson Cup this year. A CWHL team hasn’t won back-to-back Clarkson Cups since Les Canadiennes were called the Montréal Stars, but that won’t discourage the Thunder. There’s now one CWHL team in China instead of two. Bob Deraney, who spent nearly two decades as the head coach of Providence College’s women’s team, is Shenzhen’s head coach. Rob Morgan, who coached the Vanke Rays last season, is the team’s general manager. Morgan brought back international players including Alex Carpenter, Noora Räty, Hanna Bunton and Stephanie Anderson, and added newcomer Hannah Miller. It’s important to note that Räty, the 2018 CWHL Goaltender of the Year, doesn’t count against the cap on international players because she’s a goaltender. The other new faces on Shenzhen’s club are Michelle Ng and former Princeton goaltender Kimberly Newell. Both players have Chinese heritage and are expected to be in the mix for China’s national team for the 2022 Olympics in Beijing. The merger of the CWHL’s two teams in China resulted in the departure of a wealth of North American talent. Without a doubt, 2018 MVP Kelli Stack was the biggest name on that list. Stack, a snub from Team USA’s Olympic roster, made a statement to USA Hockey and the world by putting Kunlun Red Star on her back last year. Shenzhen is hoping that Carpenter can help replace what she brought to the team both on and off the ice. Also gone from last year’s clubs in China are Hickel, Emily Janiga, Ashleigh Brykaliuk, Shiann Darkangelo, and Taylor Marchin. During her collegiate career at UConn, Lum proved that she’s capable of playing both forward and defense – but Deraney will likely want her on the blue line as a mobile offensive defender. She piled up 30 points in 39 games as a senior and scored 18 goals during her junior season. Because of her Chinese heritage, Lum will not count against Shenzhen’s cap of international players. Shenzhen is, unsurprisingly, an enigma entering the 2018-19 season. The bottom line is that we just don’t know enough about how Deraney is going to use his Chinese-born players and how Shenzhen will look without Stack and Hickel spearheading its offense. So, can a Chinese CWHL team return to the Clarkson Cup Final for a second-straight year? The odds are definitely against them, but with Räty between the pipes, anything is possible. The Furies’ new general manager Sami Jo Small did an outstanding job finding and recruiting talent for Toronto’s 2018-19 roster. Small added workhorse goaltender Elaine Chuli and star forward Shiann Darkangelo, who scored 10 goals with Kunlun Red Star last season, in free agency. Sarah Nurse, 23, just won a silver medal with Team Canada at Pyeongchang after a huge senior season at the University of Wisconsin in 2016-17. Nurse is a two-way star forward who plays with an infectious energy. She still has some untapped potential when it comes to her offensive production, and there’s a good chance that Nurse will find it playing with fellow Canadian Olympian Natalie Spooner. Toronto’s 6-1 victory over Markham in the preseason has Furies’ fans understandably excited, but that was just one game and the Thunder were missing some of their best players. With that being said, Toronto is bound to be better than the 9-17-1-1 record they finished with last year. Their goaltending is young but very promising, the blue line is experienced and solid, and the offense looks significantly better than it did one year ago. Not only are the Blades in a new city, but they also have a new head coach and a new general manager. Paul Kennedy, the former power skating instructor for Team USA, is Worcester’s new head coach, replacing Kacy Ambroz. Derek Alfama, who most recently was an assistant coach at Providence College, is the Blades’ newest general manager. Kennedy and Alfama turned to the draft to begin the Blades’ rebuild. Worcester has 11 rookies, including two goalies, on its 2018-19 roster. Also gone are backup goaltender Jetta Rackleff, who plays on Team USA’s inline hockey team, and Dru Burns and Taylor Wasylk, who both signed with the NWHL’s Boston Pride. Lauren Williams was the first overall pick of the 2018 CWHL Draft. Williams is a shutdown defender with a big 5-foot-10 frame. She had 12 points in her senior season with the Wisconsin Badgers, but shouldn’t be expected to contribute much to Worcester’s offense. She’s going to block a lot of shots and log a lot of minutes playing in front of veteran goaltender Lauren Dahm and fellow rookie Jessica Convery. The bottom line is that the Blades’ talent simply doesn’t measure up to the rest of the CWHL. Hopefully, the franchise’s relocation to Worcester will help the team draw in some new fans. But those new fans are going to need to embrace the patience that has defined the Blades’ fan base over the last three years. For the fourth straight season, the Blades will be rebuilding and searching for consistency both on and off the ice.